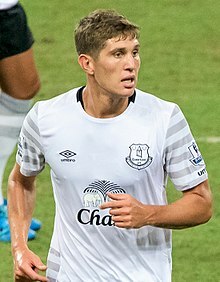 ↑ "John Stones". Barry Hugman's Footballers. Retrieved 11 November 2017. ↑ "Barnsley 0–4 Reading". BBC Sport. 17 March 2012. Retrieved 19 March 2012. ↑ "Everton sign defender John Stones from Barnsley". BBC Sport. 1 February 2013. Retrieved 18 October 2014. ↑ McNulty, Phil (10 February 2013). "Man Utd 2–0 Everton". BBC Sport. Retrieved 26 April 2015. ↑ "John Stones joins Manchester City in £47.5m deal". Sky Sports. 9 August 2016. Retrieved 9 August 2016. ↑ "John Stones: Manchester City sign Everton defender for £47.5m". BBC Sport. 9 August 2016. Retrieved 9 August 2016.